There is a market for child-free zones on flights, although they could be a logistical and political nightmare. 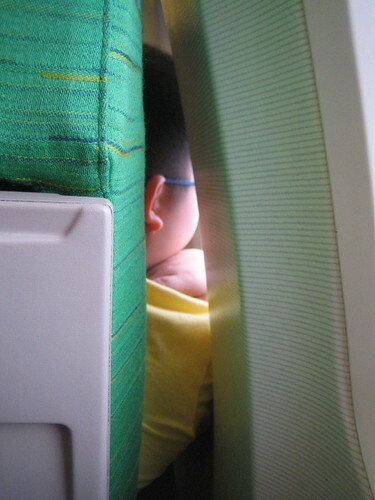 Nearly one in three air travelers surveyed in a GO Airport Express poll indicated they would be willing to pay to sit in a child-free area on the plane. Many air travelers desire more leg room and think Wi-Fi is important, with almost half and a third noting they would pay for these services, respectively, but the surprise third-place winner was child-free zones at 30%. Although everyone was once a child, clearly many air travelers don’t want to have other people’s children help them rediscover their own inner child at ear-shattering decibel levels. On the other hand, just 4% of respondents indicated they would pay extra to sit in a child-friendly area. Although segregating young passengers wielding pacifiers and wrapped in diapers might make a few airlines some money, there would undoubtedly be a backlash to cope with, as well. Child on a plane. Photo by gurmit singh. And, would there be legal issues involved? Possibly. GO Airport Express, which runs shuttles to and from O’Hare and Midway airports in Chicago, received answers to its poll from 360 travelers across the U.S. Willingness to pay for child-free areas on the plane beat out meals (21%), aisle seats (13%), movies (9%), window seats (6%), and pillows and blankets (5%). Meanwhile, perhaps passengers on flights are beginning to shrug their shoulders and accept that airlines are going to charge separately for services that once were included in the fare. In the survey, just 17% of respondents noted they think that all of the services mentioned in the poll should be bundled into the basic ticket price.